Well... 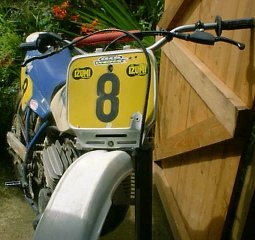 I was looking for a bike to follow my lad around on his 80 and actually wanted a CR500 but couldn't find a nice one. So rather than spend a load of cash on a bike I didn't want I thought I'd get something cheap and cheerful. I first heard of the 495 lurking around a local breakers yard in January but it was sold before I had a chance to look at it. From what I've been told it was a runner but needed sorting - the engine had been rebuilt by the previous owner but it needed odds and sods. The bike resurfaced in March in the local free ads - this time I managed to get it. The bike had had a bit of work done on it since it left the breakers. The seller started the bike for me to show it running - a real feat of bravery as it turned out - although he claimed to be selling it because he was getting a new car I suspect it was because it kicked back like a steroid enhanced mule. Starting the 495 was a bloody nightmare. After nearly being fired over the bars three or four times it ran. Loud does not do it justice - my 1200 Bandit with a race can sounds like a moped in comparison - and as for the vibration.... like nothing I've ever experienced (a little research suggested that this was in fact a feature). That's how I became an owner of a 495. As it turned out it wasn't cheap and cheerful but cheap and scary - but that's close enough. As far as I can tell its a 1982 model (although I initially thought it was an 83)- NO HOLD THAT - I now know it's an 84 thanks to lots of e-mails and entries in the forum. And of course its air cooled. Its got drum brakes front and back (yes really...) but they are state-of-the-art twin leading edge drum brakes (below) which are in fact pretty OK. You can see the front brake in the picture to the right, the back uses the same shoes. Its got USD front suspension (hard to believe KTM coupled them with drum brakes??) and an WP monoshock at the back (well that's what the sticker says in the picture above, an original 1983 photo is shown to the right- similar but different). Other state-of-the-art feature are a safety seat, wheels at both ends and, err... that's about it. Oh... its white and blue. The most obvious problem was the way it kicked back. 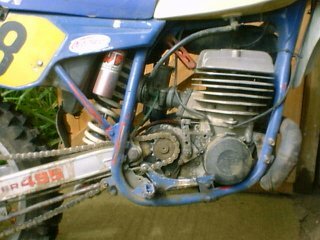 I've had bikes kick me back in the past, in fact a KLR600 ripped a MX boot apart (it had a flat battery which is why I wasn't using the button), but its a rare thing usually - not with the 495... I put it down to a feature of the bike along with the vibration (as the previous owner obviously had). 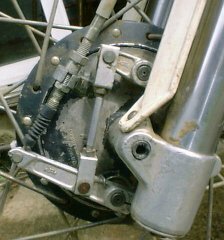 The kick start had been modified by the previous owner - he'd cut the original a welded a much bigger lever to the top, to make it easier to start he'd claimed, which it didn't, but it did stick in your leg. Noise! It was louder than ALL of the other bikes at the practice track put together. No brakes! The bike had no back brake to speak of and the front was next to useless AND stuck on - not enough to slow you down but enough to make the front wash in corners. No grip from the tires was pretty obvious - the rear was rounded off and the front was falling to bits. The bike was geared for land speed records. Crap ergonomics partly because of weird levers and crap grips - I just couldn't get on with either - the bike felt completely alien. Bits fell off on a regular basis (like I said it does vibrate a bit). The kick start was easily fixed with a second hand part from a breakers. The lack of brakes was easily fixed with a set of front and back shoes (yes shoes... remember them?) from a KTM dealer. Fitting them was easy too... except I slipped and fired a spring loaded shoe into my thumb nail... bloody ow! 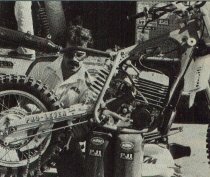 The lack of grip was easily solved with a pair of tyres - well... fitting MX tyres never is easy but you know what I mean. The grabby clutch was due to a worn clutch basket. Some filing soon sorted that. It's still geared for land speed records and is top of my to do list. The ergonic problem was partly solved with new grips and levers but its always going to ride like a combine-harvester. Lots of torque and new nuts and bolts mean thing fall off less. It's easy to start (as long as you use Quickstart), has plenty of grip, reasonable brakes and pretty fast (and its got nice gell grips and short lever rather than the monsters it came with - see picture below). It oils up if you plod it and is LOUD. It is a bit of fun though, especially when you blitz people riding kit worth 10 times as much!! I'm interested in buying a 1982 KTM 495 in good condition. Would you consider this a bike worth buying at the equivalent of $500 in your currency, or not? I would appreciate it a lot if you've got some old reports or photos that you can send me on this bike! 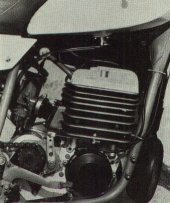 the 495 was a powerful brute of a bike that was actually faster than a 490 Maico in a drag race. We tested one at the time and geared it up to do 123.75 miles per hour at El Mirage Dry Lake with Rod Bush at the controls. The bike vibrated badly and tired a rider quickly, but it had enough power to let you gear it to the moon and still trail ride it. Time prohibits me from sending photos and/or reports to the many who request such things.